Great effort was made to insure as error-free a product as possible. With several million characters in the book, however, some mistakes are inevitable. I would be grateful to learn of any errors you find so that they can be corrected in subsequent printings. Please send them to me at susanna.s.epp@gmail.com. A collection of review materials for students is available through this website. 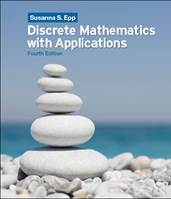 If the link doesn't work, go to www.cengagebrain.com, search for discrete mathematics, click on the title of this this book, and then click on the Access Now button.